Elegant and modern 9ct white gold wedding ring. 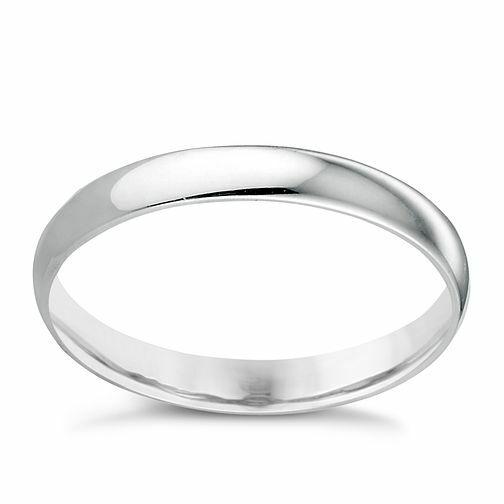 With a width of 3mm, this is the perfect ring for that special day, and every day after that. Ideal for bride or groom. 9ct White Gold 3mm Extra Heavy D Shape Ring is rated 4.7 out of 5 by 7. Rated 4 out of 5 by Anonymous from Good product - but wife said was lighter than expected Bought as replacement to a silver/gold ring my wife had lost. Thought I couldn't go wrong with a decent silver one, but my wife said for the price she exchanged it for a birthstone ring that was much more pretty from H.Samuel. So overall happy with service, and the fact that alterations to half sizes are FREE. Rated 4 out of 5 by Anonymous from Good value for money I purchased this as a final piece to my bridal set but unfortunately didn’t fit properly over my engagement ring. You get what you pay for and this is good value for the price of gold.